Slightly excited, nah majorly excited .... I am in St.Lucia to drop my daughter off with my parents, as my hubby and I are en route to Trinidad. You would be thrilled too, if you would be able to rebook your flight, knowing that your initial flight would be cancelled, resulting in delays and backed up flights, due to a snow storm. So my family and I had to get out of D.C yesterday before all flights were cancelled at 12pm, due to a snow storm / blizzard due to bring 2 more feet of snow to the area. 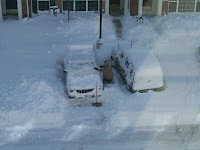 Yes, 2 more feet on top of the already 2 feet of snow we had gotten only 2 days before. A Washington D.C friend on Facebook even commented, "Trini people here are pissed they don't know when they are going home. Lol. Enjoy!" Since last Thursday, I've had friends from Washington D.C, Maryland and Virginia rebooking flights and attempting every route out the United States, just to make certain they get to Trinidad Carnival 2010. 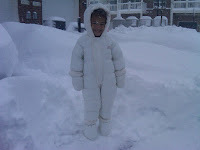 Below are pictures of the blizzard last weekend. 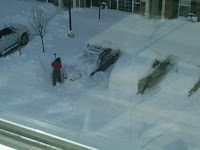 On Sunday my neighbors were helping other neighbors dig out cars from all the snow. 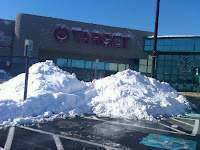 ... and then Monday I became quite the American, as I left my home to go shopping in snowmegeddon. So let me show you what I left behind ... *and thinking, I left in time, another 2 feet of snow piling on top of that with this most recent snow storm! * Didn't we just relocate from Vermont? ... And since I got out of the D.C area, and finally reached home, I am excited to share Fay-Ann Lyons' "True Lies" 758 Road Mix. 758 is the St.Lucian telephone area code. Enjoy the road mix produced by Penn & Ace out of Studio 758 in St. Lucia.